For nearly a decade, AIR has led in-depth research and development across public media in order to help guide the industry through an extended period of disruption. These efforts have involved scores of indie and station-based producers, production partners, community and national organizations, funding organizations, and research firms. The field reports presented here span from 2006 to 2017 and offer a trove of knowledge and insight gained over that time. "Break Form: Making Stories With and For the People"
Fifteen teams were embedded at public media, radio and TV stations across the country beginning in November 2015. 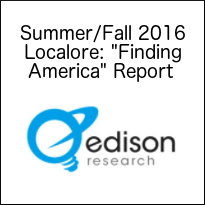 After a year of experimentation in the “far corners” of local communities, our Localore: Finding America teams surfaced new approaches to storymaking and reflect on what it means to build bonds of love and trust with a diverse range of community collaborators. 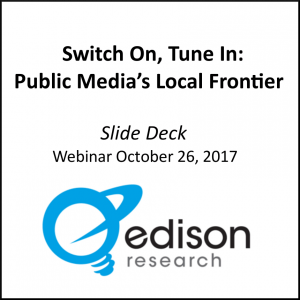 Edison Research studied the production as well, and provides insight on opportunities to build new platforms in the physical space of communities as a way to expand service to more people. To download and print the PDF, click here. Find an article of our distilled ten insights and three action items to making community-driven radio here. Strengthen AIR’s richly diverse talent network and support producers who are telling a new story of America. 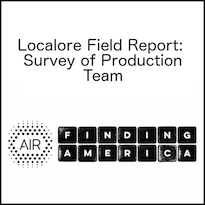 In this Localore production, AIR’s 10 teams and their station partners experimented with “full spectrum” storymaking, blending digital broadcast, and “street” or live platforms as they sought to invent new models for storymaking to reach more citizens. WIth Zeega as our interactive design partner, AIR’s Localorians created inspiring and evocative new digital platforms, including Curious City/WBEZ, Austin Music Map/KUT, Black Gold Boom/Prairie Public, and iSeeChange/KVNF in a bid to encourage others across the country to “go outside!” Experience their work here. To download and print the PDF, click here. "AIR/PRNDI Public Media Freelancer - Station Production Agreement"
AIR and the Public Radio News Directors Association (PRNDI) partnered to create a guide for freelance producers and public radio station collaborations. Journalist Susanna Capelouto led the initiative, which included a demographic survey of news directors and an analysis of freelance budgets. And, ultimately, it presented a fee structure for local freelance acquisitions. The AIR/ITVS Scan of Independent Journalists is a benchmark analysis, funded by CPB and conducted by Market Trends Research, provides new insight into how independent radio, television, and online producers intersect relative to the rapidly evolving landscape of public media. "Spreading the Zing: Reimagining Public Media through Makers Quest 2.0 (MQ2)"
"Mapping Public Radio's Independent Landscape"